Dentures are a time-tested and reliable way of replacing missing teeth. Crowns, bridges and dental implants are effective ways to replace missing teeth. However dentures are also a cost-effective and affordable treatment option too. We cater for all your denture needs including fabrication of new dentures, denture repair and maintenance. Dentures are safe to use and require minimal preparation of teeth for fabrication. They are still a long-lasting and excellent way to replace multiple teeth. There are still very few successfully tested methods to replace whole arches of teeth aside from full dentures. 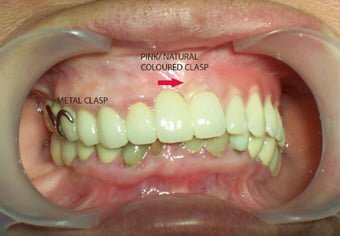 We are able to use all sorts of denture materials, from acrylic matching the colour of your gums and teeth, strong and long-lasting cobalt-chrome and even flexible and highly aesthetic Valplast™. We’ll carefully advise you on the best material suited to your needs and we’ll design a comfortable and stable denture tailored to your teeth and gums. Often dentures require adjustments and repair after long-term use. We can do arrange quick relining of your dentures and some denture repairs may be done on the same day. Our care extends beyond the clinic as we’ll advise you how to keep your dentures clean. Visit our informative blog for further information regarding proper denture care. We allow 3 months free adjustments for dentures made at Marsfield Dental Care.